Jobu reviews the Yankees two-game series against the Baltimore Orioles. It’s a day late, but still good! This is an odd week for the Yankees. Instead of playing one four game series against a divisional opponent, they travel to two different places for two two-gamers against the Orioles and Blue Jays. Being that they played at home to end last week, they are traveling three times in just a few days time. The first stop of this little mini-road trip was Baltimore to face the (sigh) first-place Orioles. Here’s how it all went down. This one wasn’t particularly pretty, but a win is a win is a win, and a least Mark Teixeira looked good in the game. Tex, Curtis Granderson and the bullpen were pretty much the heroes of this Yankees win. So I’d like more of these “Iván Nova Doesn’t Lose” posts to be like last week, when he actually pitched really well and won his game. Monday night’s showing from Nova raised more questions than it answered about the right-hander, and he left with an injury to top it all off. Nova continued his 2012 trend of leaving a million pitches up and giving up all the extra base hits. It’s like he’s trying toast some kind of record. The league is hitting .326 off of Nova, and he’s allowed 20 doubles, 3 triples and 9 home runs in just 43 innings. It’s getting scary. In game one of this series, Nova was hit in the foot by a comebacker, and eventually left the game with a contusion in his right foot and a right-ankle sprain. Not sure if he’s going to miss a turn or not, but it might help. At least we know the Yankees have David Phelps waiting in the wings. The Yankees bullpen was brilliant in this game, yet again. Clay Rapada (who left the game with some kind of viral death plague), Phelps, Boone Logan, Cory Wade and Soriano combined for 3.2 scoreless innings and only allowed three hits between them, while striking out six. Logan in particular seems to be on fire lately, with 11 Ks in his last 4 innings (there’s only 12 possible outs there). Lost in the shuffle of the evening was that David Robertson didn’t pitch the eighth or ninth innings in this one. At first, I thought Girardi was just being stupid again (two ninth inning guys, no eighth), but it turns out Robertson was suffering from an oblique injury. He would be placed on the 15 day DL after the game… ugh. 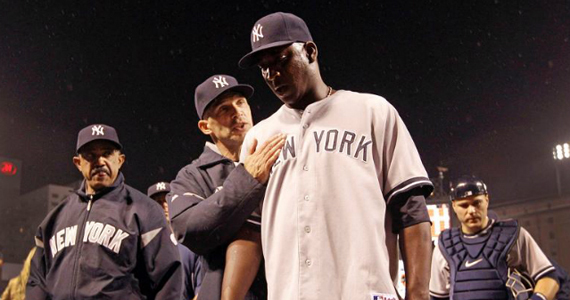 So far, as the new closer, Soriano is 1-1 in saves. Let’s hope he keeps it up. Let me set the record straight here. I’m not going to complain about scoring eight runs. That’s gonna be enough to win like 80% of the games the Yankees play this year. I would have liked, however, if the team wasn’t 1-10 with RISP. Franky, I’m not even sure how they managed to score so many runs in this game, but the scoring began in the top of the fourth. Álex Rodríguez led things off with a single and was followed by another single from Robinson Canó. Tex grounded out, which brought up my boy Nick Swisher. Swish hit one into the right-centerfield gap, which cleared the bases and tied the game at two. In the top of the fifth, the Yankees took a 3-2 lead on an absolute bomb by Curtis Granderson (note: Curtis has only homered at Yankees Stadium and Camden Yard this season). He became just the 61st guy to hit one onto Eutaw Street in the 20-year history of Camden Yard. Good job, Curtis. 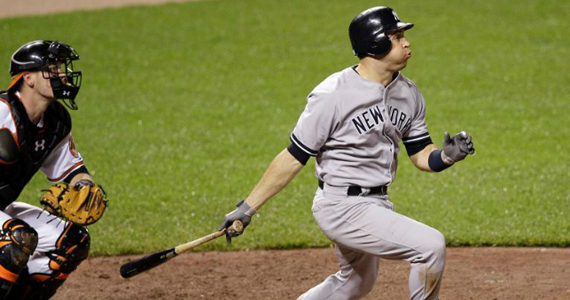 After Nova coughed up the lead, the Yankees went back to work in the top of the sixth. Canó doubled and Tex and Swish walked to load the bases with nobody out. Raul Ibañez tried to hit into a double play, but it was booted by Chris Davis. Two runs scored on the gaffe, and the Yankees had first and third with still nobody out. A pop-up, walk (to re-load the bases), a strike out and a fly ball later, and the RISP fail continued. In the top of the seventh, my TV went on the fritz again, because I could have sworn Tex followed an A-Rod single with a clutch two-run homer to give the Yankees a late 7-5 lead. Stupid Cablevision. Seriously though, that was a huge hit for Tex, and it was good to see him hit one out as he continues his battle with some kind of weird death plague/respiratory infection of his own. Go Tex. The Yankees scored one last run on a sacrifice fly by Eric Chavez in the top of the ninth, and that was it. Overall a good performance, but they could have done a lot more. This game was pretty crappy to watch, but I put myself through it for you fans. Franky, once it got to be 2-0 I had that feeling that it was over. The Yankees ended up putting up the two runs I didn’t think they’d get of Wei-Yin Chen, but Sabathia didn’t have his best game, and they lost 5-2. I’m not going to sit here and be mad at CC Sabathia for one bad game. The last four times, he’s been a hero, so he’s allowed to have an off-night once in a while. Anyway, if the Yankees offense hadn’t fallen in love with the douple-play the last few games, he might have won it anyway. Sabathia gave up a solo home run to Adam Jones in the bottom of the second for the first run. The second run scored on a double play by J.J. Hardy, and Hardy plated two more runs, one each in the fifth and the sixth. 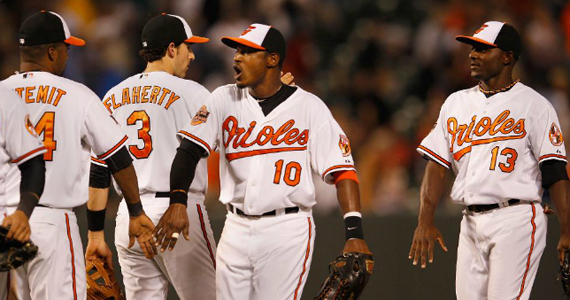 So really, it was Hardy that beat the Yankees 3-2. CC didn’t have his best stuff in this one, but he certainly didn’t stink up the field. The only two runs the Yankees scored came in the top of the seventh when Granderson hit a high fly ball that just got over the fence in left. In fact, it was almost caught, but a fan got in the way of left fielder Xavier Avery. The homer scored Canó, who had reached base earlier in the inning on a double. Big fat woop. The Yankees did nothing the rest of the game other than hit into three double plays and build up their their RISP failures. Shameful performance. Lost in the shuffle lately has been terrible starter turned long reliever Freddy García. Freddy pitched two more innings in relief of Sabathia in this game, and they would have been scoreless if it weren’t for a terrible call on a SB by Jones (he was waaaay out) and a passed ball by Chris Stewart. Freddy has very quietly become a pretty reliable long man, and I’m glad he’s at least contributing.